Thank you to M&M’s and Snickers for sponsoring this post. As always, my opinions are my own. And you know I love tailgating and football! Whether you’re heading out to the game to watch all the action in person, hosting a game day gathering with friends and family, or just getting the fantasy league together, tailgating can be a little tricky. But with these 9 Tips for Tailgating Like a Boss, you’re going to be the MVP of the tailgate party! 1. 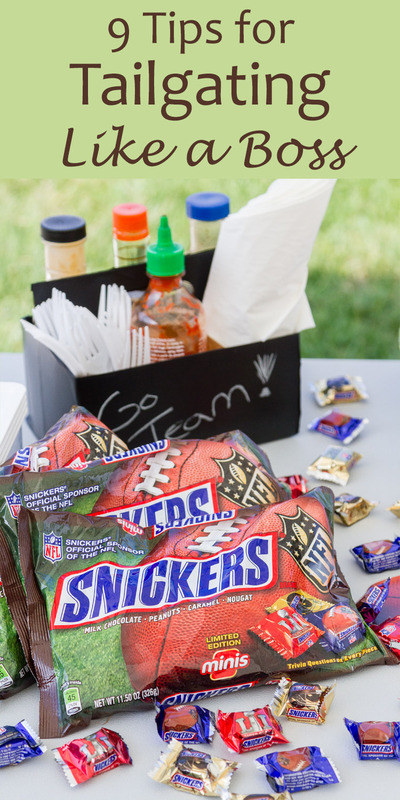 Bring Snickers NFL Minis to the game to ward off the hangries (getting angry because you’re hungry). These Snickers NFL Minis are so cool. You can find these exclusively at Target. I love that each candy has football trivia printed on it. We had fun reading and answering the questions. And, we learned a few new things! Pick up some fun Snickers NFL Minis at Target today! 2. Pack up your cooler using frozen water bottles rather than ice. Unlike, ice, frozen water bottles won’t “water down” your cooler and get your stuff all wet. When the ice melts, you can drink the water. Just put your water bottle in the freezer the night before, and you’ve got great ice packs on game day that later melt into thirst quenching water. Also, be sure to pack your Snickers in the cooler so they don’t melt on hot days. I wrapped my drink carrier in chalkboard contact paper so I could write a fun message on it! Go Team! 3. Cardboard drink carriers make the perfect holder for plastic utensils, condiments like hot sauce and ketchup, and paper napkins. You can even decorate your drink carrier with adhesive contact paper. Try making one in your team’s colors to show your support. Or use chalkboard contact paper like I did to write fun messages on it. 4. Make sure to be as comfortable as possible while you’re tailgating, especially if you’re out all day. Make sure to bring plenty of seating, as well as tables. Fold up chairs work well because they can be folded, packed, and travel easily. Folding tables are also highly recommended so you can put all your tasty food out for noshing. Easy-ups also make for great comfort, as they help provide shade or protection from any rain. 5. Make sure to have lots of paper towels for easy clean up. Hang a roll of paper towels with a bungee cord right from the easy-up for easy access. 6. Keep a bag or toolbox packed with tailgate essentials in the trunk of your car. Keep items like BBQ tongs, lighters, a backup roll of paper towels, extra paper plates and utensils, garbage bags (or even used grocery sacks to carry trash), anything you think you might need at your tailgate. 7. For colder days, bring soups in thermoses. And for morning games, bring coffee and hot chocolate in thermoses to keep hands warm and mouths happy. Blankets are also a welcome warmer on those cooler days. 8. When you get to the game, seek out tailgating spots by the grass for spreading out (maybe even with a tree for some shade), near the fringes for fewer neighbors, or by the bathroom. Make sure to be friendly to your neighbors, whether they are rooting for the same team as you, or for the opposing team. Bring along some extra Snickers to share; nothing says “welcome, friend!” like sharing your Snickers. I love iced coffee at any event, and this little trick helps keep my coffee bug free! 9. Keep your drink cup bug free by popping your straw through a cupcake liner. Again, you can do this with cupcake liners in your team’s colors to show your support. You’re ready to tailgate like a boss. Great food hacks, these, but I have no idea what tailgating is other than following another car closely behind them, lol! That’s awesome. Haven’t seen the NFL snickers yet– my husband would love these. Ahhh this is awesome!! Wish I knew all of these awesome hacks when I tailgated at the Pats game last month!! I love these tips! The upside down cupcake holder, especially! Those are some very useful tailgating tips! Everything is better when you’re organized (and have a snickers 🙂 ). Love getting together with friends, cute ideas. The paper towel roll hookup is genius! Snickers is my favorite candy! SNICKERS! Yum! that is tailgating “like a boss”! Snickers are my biggest sweet treat weakness! These are great tips! We LOVE tailgating season! Great tips! What a fun tailgate. Love the tip to keep the snickers from melting! Okay, I”m pinching one of these ideas for camping. I love the paper towel holder using a bungee cord, very clever! Lori, I think that tailgating and camping share a lot of the same qualities. Pinch away! Love the cup cover idea! Great tips and ideas here! You’re right! This is tailgating like a boss for sure! Great tips. I love that covering your drink one. I wonder how many bugs I have drank over the years. Great tips! Snickers are my favorite candy bar, so thanks for the 5% off. So fun that they have the football facts, too! Like Elizabeth, I only know tailgating to mean when you follow the car in front way too closely but I can figure out what you mean from the post! Two nations divided by a common language, right?! Love the kitchen roll holder! Tailgating is so much fun whether done at the game or in your home with friends. You have provided some really good ideas for my next event. You totally have tailgating down! Love all of the great tips especially the paper towel hanging and also the condiment holder – so cute!